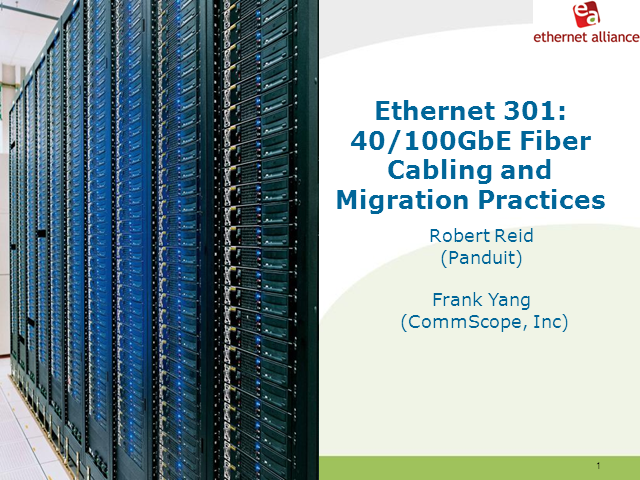 Join presenters Frank Yang, CommScope, Inc. and Robert Reid, Panduit as they present the Ethernet Alliance webinar “Ethernet 301: 40/100GbE Fiber Cabling and Migration Practices” live on March 21, 2012. This webinar will discuss the advancement and future deployment of 10G Ethernet what it means and why it is important. PoE has already become the go-to for devices requiring low-voltage power. Coupled with emerging Internet of Things (IoT) devices like security cameras, medical devices, LED lighting, and more, the PoE application space is booming. With ratification of IEEE 802.3.bt drawing nearer, the Introducing IEEE 802.3bt™ Power over Ethernet webinar offers clarity on what to expect from this innovative technology. Over the next five years 800 million PoE Enabled Switch Ports and hundreds of millions of powered devices are forecasted to be deployed. The Ethernet Alliance is introducing the Power-over-Ethernet (PoE) Certification Program, whose logos will allow the easy recognition of PoE devices that are based on IEEE Std 802.3™-2015 PoE specifications. Join us on May 1, 2018 to find out about more about this exciting program. In late 2016, the Ethernet Alliance and the NBASE-T Alliance held the first-ever joint plugfest for 2.5GBASE-T and 5GBASE-T Ethernet products. The industrywide effort brought together 15 diverse stakeholders from across the Ethernet ecosystem, including manufacturers of Ethernet switches, NICs, wireless LAN access ports, physical layers components, cabling, protocol test, and electrical test equipment. This joint webinar will provide an in-depth overview of the testing and subsequent results. The Ethernet Alliance will host a webinar on Power over Ethernet (PoE) that will be open to the public on April 20th at 11am. Vice Presidents Alan Weckel and Chris DePuy of the Dell’Oro Group will join Scott Kipp and George Zimmerman of the Ethernet Alliance to discuss the latest developments and forecasts for PoE. The Ethernet Alliance is pleased to announce the sixth “Analyst Hour” webinar where Dell’Oro will talk about “50GE and the Path to 200GE and 400GE”. Join us on Tuesday, October 13th at 10am PT featuring Alan Weckel, Vice President and Alam Tamboli, Senior Analyst with Dell’Oro Group. Weckel and Tamboli will present on the upcoming release of 25GE and 50GE (2X25G) products and how they will lead to 200GE and 400GE. Daryl Inniss has been in the industry for over 25 years. He spent the first half of his career doing optical fiber research at AT&T Bell Laboratories followed by a couple of years as Technical Manager for high power lasers and amplifiers at JDSU. Inniss has been at analyzing the Component market since 2001. He holds a bachelor’s degree from Princeton University and a PhD degree in Chemistry from UCLA. As data centers continue to scale to meet the explosion of mobile and the consolidation of data in the cloud, network engineers look increasingly at ways to migrate their infrastructure from the current Gigabit Ethernet (GbE) speed to the latest 10 Gigabit Ethernet (10GbE) technologies. Among the 10GbE interconnect solutions, 10GBASE-T, i.e. 10GbE over Copper cabling, has now become the fastest growing option among all. Register for this Ethernet Alliance webinar provided by Cisco and Aquantia to learn more about the technology, the vast ecosystem of switches and servers carrying this interface and the benefits 10GBASE-T can provide in comparison with GbE in cloud and corporate data centers. •What do we make of the ramping sales of 40Gb Ethernet optical modules? •Is 100Gb Ethernet inside the datacenter just around the corner? •What are the paths to the next Ethernet fabric data rate? Ethernet 101: Introduction to Ethernet is the highest level webinar in the University of Ethernet series and introduces the viewers to Ethernet. This webinar reviews the early days of Ethernet when it was a shared medium, looks at typical deployments today and looks into future directions for Ethernet when links will run at 400 Gigabits/second and beyond. This webinar will not go into technical details and discusses new applications of Ethernet to show how Ethernet plans to expand into new areas over the next 40 years. Data Center Bridging and convergence are important trends in datacenters. More companies are looking to leverage the efficiencies of converging workloads onto Ethernet infrastructures. A critical component of convergence is the ability to define quality of service policy to prevent starving workloads in a converged environment. The DCBX/ETS webinar from the Ethernet Alliance will describe data center bridging and how workload starvation is prevented by using the Enhanced Transmission Selection capabilities of data center bridging to enforce quality of service policy. The webinar will also cover how DCBx enables efficient, automated, and error-resistant changes to the configuration of Ethernet devices in the data center. Plumbing for Clouds: Creating data centers that allow multiple tenants to share physical resources offers efficiency in resources but also presents challenges of how to share the resources and how to interconnect them. This webinar is meant for any company that is facing the challenges of multiple tenants sharing common resources. It will discuss the network problems associated with multi-tenancy, review several pre-standard solutions that can be deployed, as well as update the audience on the status of current standardization efforts. It will review the applicability of the IEEE 802.1 Bridging standards and possible extensions to support multi-tenancy. If you are dealing with or planning to implement a multi-tenant solution you will want to attend this informative webinar. The Ethernet Alliance is a global community that includes system vendors, component vendors, end users, industry experts and university and government professionals who are committed to the continued success and expansion of Ethernet technology.